The mission of ANTAM is to ensure the sustainability and high quality of agricultural machinery produced, traded and used in participating countries in the Asia-Pacific region through harmonization of testing codes and standards of agricultural machinery applied in the region, and application of uniform or mutually recognized testing procedures that address quality, performance, occupational safety and environmental sustainability of agricultural machinery. Facilitate intraregional trade of sustainable agricultural machinery. The ANTAM project was launched on the success of the Regional Network for Agricultural Machinery (RNAM) . In the 1980s RNAM produced very successful sets of Codes that are still used in the Asia Pacific region. At CSAM’s meetings over the past few years, countries expressed strong desire for coordinated regional efforts to develop and adopt mutually recognized testing procedures. Member countries are aware of the enormous potential of harmonized codes to stimulate technology innovation and to increase farmers’ access to suitable, quality and cost-effective machinery. ANTAM was formally proposed at the Roundtable Forum for the Regional Agricultural Machinery Manufacturers/Distributors Associations held by CSAM (then called UNAPCAEM) in Seoul, Korea in 2006 in collaboration with the Ministry of Agriculture and Forestry of the Republic of Korea and the Korea Agricultural Machinery Industry Cooperative (KAMICO). In preparation for the establishment of ANTAM, CSAM commissioned a feasibility study in 2009 which reviewed the status of agricultural mechanization in the Asia-Pacific region. CSAM also conducted a desktop survey in 2011 which analyzed testing standards of agricultural machinery in member countries. The feasibility study, suggested phased approach to: (i)develop region-wide testing codes; (ii) upgrade the existing infrastructure; (ii) improve the professional knowledge and skills of the technicians. 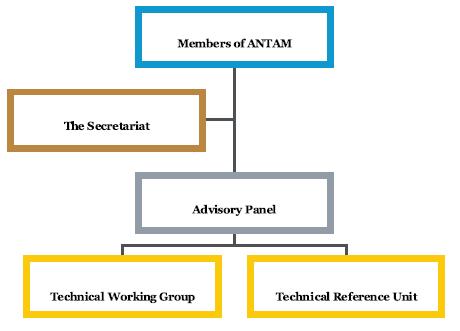 The 1st ANTAM Annual Meeting in Beijing, China, in September 2014 approved the TOR and agreed to establish a Technical Working Group (TWG) to develop mutually recognized test codes. Thank to the hard work of the TWG members we finalized our first sets of Codes in July 2015. The 2nd Annual Meeting will be held in New Delhi, India, in December 2015. The Asian and Pacific Network for Testing of Agricultural Machinery (ANTAM) is an open regional network composed of national testing stations of agricultural machinery, research institutes, associations of agricultural machinery manufacturers and farmers organizations across the Asia-Pacific region. ANTAM is open to member States and associate members of ESCAP. Participation in ANTAM is voluntary. Members of the Network are represented by designated national focal points of the Network. Others shall be accepted as observers upon application and approval by the Secretariat of ANTAM. Observers do not have the right to vote. The daily operation of the ANTAM Secretariat is supported by CSAM. The Secretariat also seeks extra-budgetary resources, including financial and in-kind contributions from participating members of ANTAM, other donors to fund substantive activities of the Network. The Regional Network for Agricultural Machinery (RNAM) was established by the United Nations Economic and Social Commission for Asia and the Pacific (ESCAP) in cooperation with the United Nations Industrial Development Organization (UNIDO) and the Food and Agriculture Organization (FAO) in 1977 in Los Baños, the Philippines. There were eight participating countries: India, Indonesia, Islamic Republic of Iran, Pakistan, Philippines, Republic of Korea, Sri Lanka and Thailand. In 2002, RNAM was upgraded to a Centre known as the Asian and Pacific Centre for Agricultural Engineering and Machinery (APCAEM) located in Beijing. APCAEM then adopted its current name as Centre for Sustainable Agricultural Machinery (CSAM) in 2012.